The east coast of Phuket is very, very different to the west coast. All the main tourist areas and beaches are found on the west coast, while large parts of the east coast are almost untouched by tourism. 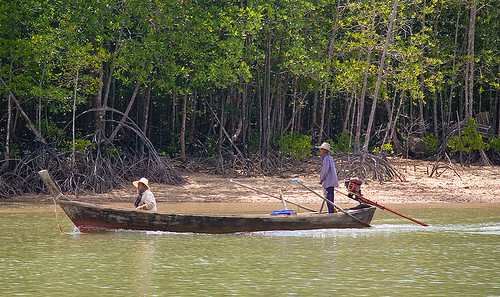 Much of the coastline is mangrove forest, with large areas of rubber plantations in the hills, along with shrimp farms, small fishing villages, quiet bays and some great views if you drive round the hilly back roads. If we're lost for something to do, we often just "go for a drive" and see what we can find. And it was on one of these days, must have been in 2005, that we first found Bang Rong. Check the photos below. Yes, this is Phuket. Bang Rong is a small Muslim community on the North East coast close to Bang Pae Waterfall and the Gibbon Rehabilitation Project. From Bang Rong Pier you can take a ferry to Koh Yao Noi, which we have done a few times, or other islands in between Phuket and Krabi. 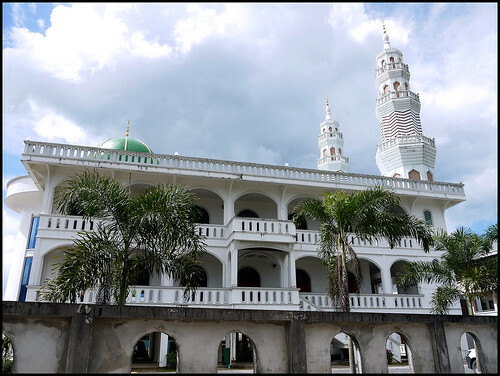 The road down to the pier is easy enough to find, turn right off the main road at the mosque, about 1km north of the entrance to Bang Pae waterfall. There's a map at the bottom of the page. There's an entrance gate to the pier. If you are parking long term, like getting a ferry to Koh Yao Noi or Koh Yao Yai, then you have to pay a parking fee. If you are just coming to eat or have a quick look, you do not have to pay. 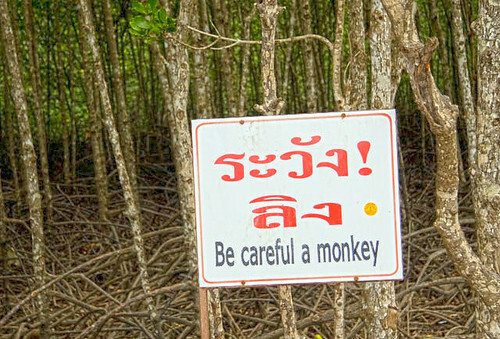 You will almost certainly see monkeys in the mangroves or on the road near the pier, or they might come out to say hello. They can be a bit cheeky, hanging around looking for food. We've been here many times now, and we like the small family run floating restaurant (it's actually called Chum Chon restaurant, though we always just call it 'Bang Rong') which is reached by a wooden walkway through the mangroves. We first ate here on our first visit more than 10 years ago and we still like it. It's a quiet place for lunch with good seafood or just simple things like fried rice. We always find it very friendly. 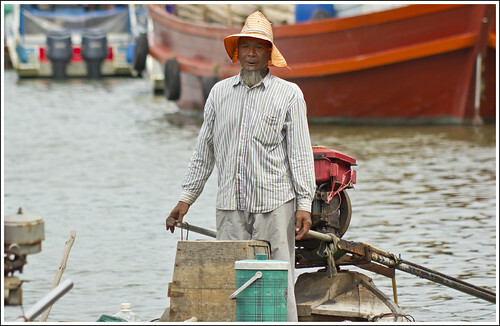 I like to sit at our table by the water and snap pictures of passing boats, heading up the mangrove channel. It's a different world here, a million miles from the tourist beaches and yet only about a 25 minute drive from our house! 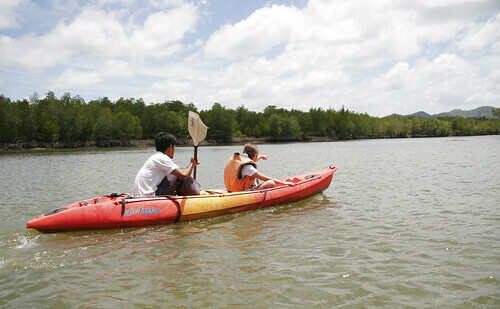 There are some kayaks for rent at the restaurant, which you can paddle up into the mangroves. They have a deal with a couple of tour companies to include a quick paddle in the tour itinerary. 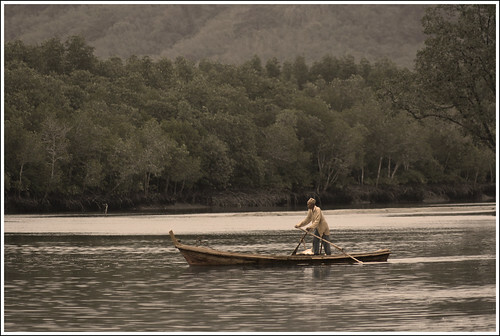 Or you can just rent one (with or without a paddler, who will be one of the family running the restaurant). 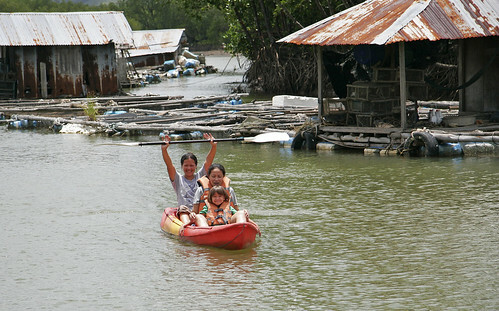 We did this a few years ago and do mean to do it again one day - see Kayaking in the Mangroves. It's a nice way to spend an hour. I think the rental now is about 200 Baht for 1 hour. You see all kind of folks and all kind of boats here. 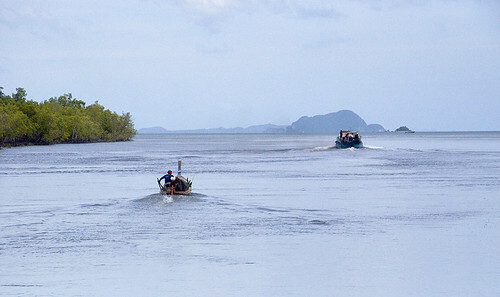 The longtail boat below was coming in from Koh Yao Noi. 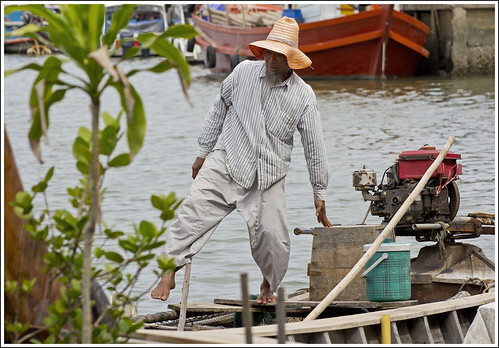 Every boatman has his "boy" (often a son or relative) to help with the boat. 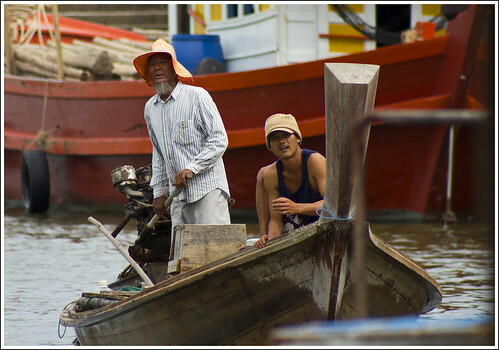 I watched them approach and tie up the boat through my 300mm zoom! Bang Rong is one of our favourite quiet places to sit and relax. It's very peaceful here, just the odd longtail engine to disturb the silence. 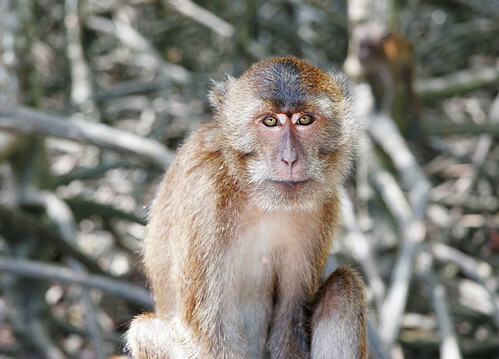 Makes a good day out combined with the waterfall, the gibbons, a kayak trip in the mangroves, or maybe a visit to the new Phuket Elephant Sanctuary which is not far away. 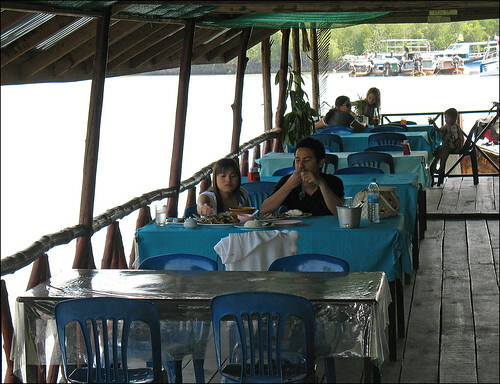 Or you can just grab lunch here before getting a boat to Koh Yao Noi or Koh Yao Yai.